der beste party wohnwagen! mit fleiluft dusche in dänemark! alle mal anklicken und auf LIKE auf der seite drücken! dann wird er gabaut und alle haben spass! 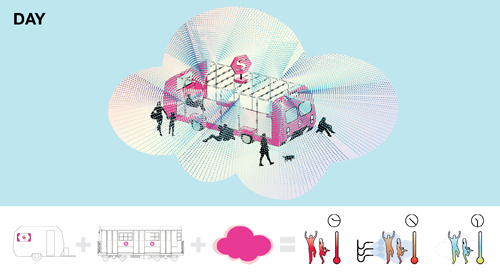 NEBULA is a wet party oasis that uses irrigation pipes and sprinklers to generate a cloud of water vapor. 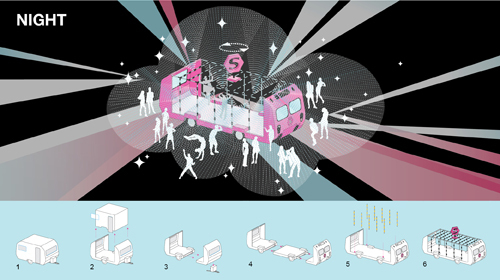 NEBULA transforms a traditional trailer into an S-TOG train, converting the common S-Toget night journey into an interactive sensory experience. Strobe lights and LEDs plugged into the train react to live audio stimuli, synchronizing light movement and intensity with the frequency of electronic music. During the day, NEBULA provides a chill-out mist and sun protection for the hungover Trailerpark crowd. At night, the mist amplifies the luminescent visual display and generates an electrifying party atmosphere. Moisture droplets refract and intensify the strobe lights and LEDs, illuminating the mist cloud in violent, vivid flashes. Dieser Eintrag wurde am Donnerstag, 09. Juni 2011 um 16:31 erstellt und ist abgelegt unter ARTIKEL, Allgemein. Mit dem RSS 2.0 Feed kannst du den Antworten zu diesem Artikel folgen. Beides, Kommentare und Pings sind zurzeit geschlossen.